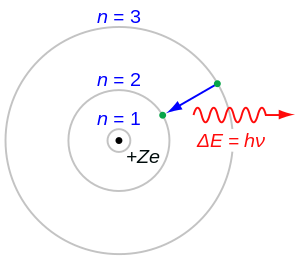 The Rutherford–Bohr model of the hydrogen atom (Z = 1) or a hydrogen-like ion (Z > 1). In this model it is an essential feature that the photon energy (or frequency) of the electromagnetic radiation emitted (shown) when an electron jumps from one orbital to another be proportional to the mathematical square of atomic charge (Z2). Experimental measurement by Henry Moseley of this radiation for many elements (from Z = 13 to 92) showed the results as predicted by Bohr. 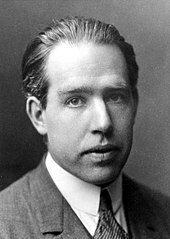 Both the concept of atomic number and the Bohr model were thereby given scientific credence. 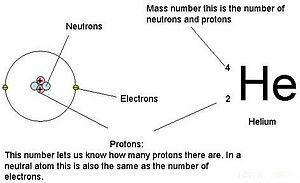 The atomic number or proton number (symbol Z) of a chemical element is the number of protons found in the nucleus of an atom. It is identical to the charge number of the nucleus. The atomic number uniquely identifies a chemical element. In an uncharged atom, the atomic number is also equal to the number of electrons. The sum of the atomic number Z and the number of neutrons, N, gives the mass number A of an atom. Since protons and neutrons have approximately the same mass (and the mass of the electrons is negligible for many purposes) and the mass defect of nucleon binding is always small compared to the nucleon mass, the atomic mass of any atom, when expressed in unified atomic mass units (making a quantity called the "relative isotopic mass"), is within 1% of the whole number A. The conventional symbol Z comes from the German word Zahl meaning number, which, before the modern synthesis of ideas from chemistry and physics, merely denoted an element's numerical place in the periodic table, whose order is approximately, but not completely, consistent with the order of the elements by atomic weights. Only after 1915, with the suggestion and evidence that this Z number was also the nuclear charge and a physical characteristic of atoms, did the word Atomzahl (and its English equivalent atomic number) come into common use in this context. 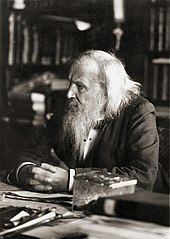 Dmitri Mendeleev claimed that he arranged his first periodic tables (first published on March 6, 1869) in order of atomic weight ("Atomgewicht"). However, in consideration of the elements' observed chemical properties, he changed the order slightly and placed tellurium (atomic weight 127.6) ahead of iodine (atomic weight 126.9). This placement is consistent with the modern practice of ordering the elements by proton number, Z, but that number was not known or suspected at the time. A simple numbering based on periodic table position was never entirely satisfactory, however. Besides the case of iodine and tellurium, later several other pairs of elements (such as argon and potassium, cobalt and nickel) were known to have nearly identical or reversed atomic weights, thus requiring their placement in the periodic table to be determined by their chemical properties. However the gradual identification of more and more chemically similar lanthanide elements, whose atomic number was not obvious, led to inconsistency and uncertainty in the periodic numbering of elements at least from lutetium (element 71) onward (hafnium was not known at this time). In 1917 Rutherford succeeded in generating hydrogen nuclei from a nuclear reaction between alpha particles and nitrogen gas, and believed he had proven Prout's law. He called the new heavy nuclear particles protons in 1920 (alternate names being proutons and protyles). It had been immediately apparent from the work of Moseley that the nuclei of heavy atoms have more than twice as much mass as would be expected from their being made of hydrogen nuclei, and thus there was required a hypothesis for the neutralization of the extra protons presumed present in all heavy nuclei. A helium nucleus was presumed to be composed of four protons plus two "nuclear electrons" (electrons bound inside the nucleus) to cancel two of the charges. At the other end of the periodic table, a nucleus of gold with a mass 197 times that of hydrogen was thought to contain 118 nuclear electrons in the nucleus to give it a residual charge of + 79, consistent with its atomic number. ^ Moseley, H.G.J. (1913). "XCIII.The high-frequency spectra of the elements". Philosophical Magazine. Series 6. 26 (156): 1024. doi:10.1080/14786441308635052. Archived from the original on 22 January 2010. This page was last edited on 13 March 2019, at 18:42 (UTC).